really goood stuff!!! can u design one exclusively for me. Memoirs of an Invisible Girl.. 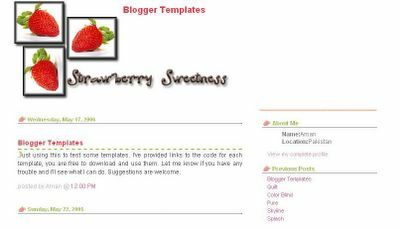 I love this template, but I like more if don't have the phrase "strawberry sweetness", is very sweet and beautiful, congratulations. Saludos. how do u make your own template? i want to make one for me!! I love this template. 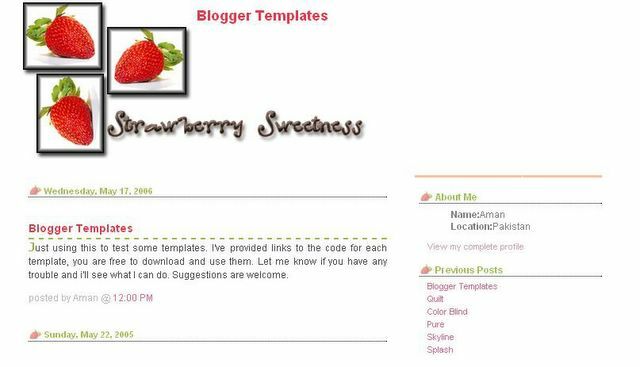 And I will use it in the blog named News Berry. But I found one thing wrong when the template is applied and showed on IE. The side of this page cannot display normally with IE. You cleared up my big trouble. Thanks you very much, Aman. How do you know that the link is the trouble spot? I would love to use this template. I downloaded it and try to use it for my blogger, but it didn't quite work. all the strawberries didn't show. I know this is an old template, do you think this can be fixed? Thanks! can't download the template. the server is down. hi there!this template looks great and i really want to use it but somehow it did not work..can you please fix it?thanks so much! HELLO! can u teach me how to space out the 2columns (content and profile)? sorry, is it also possible to have a blog title yet make sure it doesn't show on the template? Oh, I want this layout but I can't download it! Can you help me, please? i was trying to use the strawberry template.. and i think i did exactly what you said..
it says "The content of elements must consist of well-formed character data or markup". love it!! thanks a lot!! i can't find the error.. i did it 3 times! im completely new to this... can u help me check it? www.polinw.blogspot.com HELP! I upload the template and it comes out like this!! I want one for my blog http://besthotelsinlondon.blogspot.com . Can you please recommend me any. I took this. Thank you!! Love the neatness of your layouts. Are you singaporean? "Your template could not be parsed as it is not well-formed. Please make sure that all XML elements are closed properly. where is the codes ?? Please click on Get 2 Column Template to download the code.